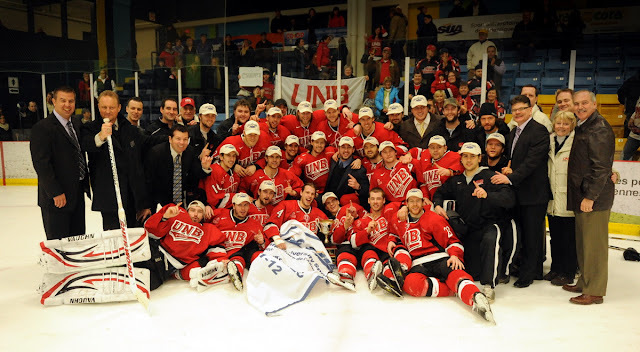 The University of New Brunswick defeated the Universite de Moncton Aigles Bleus 4-0 in Moncton tonight to sweep their best-of-5 AUS Finals series. The Varsity Reds claim their second consecutive AUS title and 12th overall. The game did not start well for UNB as Thomas Nesbitt received a 5 minute major for checking from behind and a game misconduct in the early going. The Varsity Reds penalty killers were up to the task however, as they limited Moncton to few good chances. Shortly after the penalty expired Daine Todd, who was serving the major, stepped out of the box and joined a 3-on-2 rush with Chris Culligan and Shayne Wiebe. The puck found its way over to Todd who put the puck past Moncton goalie P.A-Marion at 7:07. UNB would get a power play of their own just over two minutes later and would take advantage only 14 seconds in when Luke Gallant let a high shot go from the point that found its way through some bodies in front and into the back of the net. Jonathan Harty and Culligan received assists on the play. The Varsity Reds would make it a 3-0 game 5 minutes later with another power play goal, after Moncton was assessed a 4 minute double minor for high sticking. Gallant got the puck after a Kyle Baile face-off win and once again unleashed a shot from the blue line, but Marion deflected the puck right to a pinching Harty at the edge of the crease. Harty made no mistake putting the puck in to give the V-Reds a three goal lead. That was all of the scoring in the period as UNB held a 9-8 advantage in shots. The Varsity Reds would add another at 14:28 of the second period. Culligan and Wiebe were both alone in front of Marion and Culligan made a soft drop-pass back to Wiebe, who got just enough of it over the goal line. Tyler Carroll also picked up an assist on the play. Moncton would then run into some penalty trouble at the end of the period, including a 5 minute major for slashing, that would give UNB a couple of 5-on-3's and a long power play to begin to the third. Shots were 17-6 in the period for the V-Reds. The Aigle Bleus managed to kill off the long UNB power play to start the period but the Varsity Reds played stifling defence the rest of the way, giving Travis Fullerton the shutout. The best chance of the period came 12 minutes in when Dion Campbell was stopped on a breakaway. Shots favoured UNB 7-3 in the period and 33-16 in the game. - Jordan Clendenning was back in the line-up. Geordie Wudrick, Jeff Lee, Stefan Salituro, Luke Lynes, Ben Shutron, Spencer Corcoran, and Chad Denny were all out. - Chris Culligan (3 assists) was named the player of the game for UNB while Marion (29 saves) took the honour for Moncton. - UNB went 2 for 9 on the power play while UdeM was 0 for 4. - Culligan led the team, and league, in playoff scoring with 13 points in 6 games. Bailey and Wiebe both recorded 8 points. - Fullerton posted a 1.82 GAA and 0.917 save percentage in UNB's 6 postseason games. - The much maligned V-Reds power play went an impressive 10 for 39 in the playoffs, good for a 25.9% success rate. UNB killed 28 out of 34 (82.4%) power plays. - Both team now move on to Nationals, which start next Thursday afternoon at the AUC. UNB will almost certainly be seeded #1 heading into the tournament and will play their first game Thursday night. Moncton will most likely open that afternoon. We will have plenty more in the coming days, including pools and schedules as soon as they become available, so make sure to check back often. For now though, let's enjoy this one. E-Mail Your Support To The Team! Could The AUC Host Game 7 Of The QMJHL Finals? Have any photos, videos, or interesting stories or commentary you want to provide, or want to join the team?